This map will be part of what I hope to be a three part series. Each one of them will depict the three Punic Wars fought between Rome and Carthage. I chose to start with the Second Punic War since it is the most interesting of them all. I also plan to make two versions of each map. One version of the maps will be utilising a conquest/objective gameplay while the other will be using a classic gameplay. The seeds of war for the Second Punic War were sown at the end of the First Punic War. The territorial losses suffered by the Carthaginians at the hand of the Romans were still an open wound and the Carthaginians yearned for revenge. The Mediterranean was too small for these two super powers of their time. The Second Punic War marks the decisive encounter between the Mediterranean powers. Rome emerged victorious at the end of the 16-year-long conflict and Carthage was humbled to a second humiliating loss which would never give her any chance of rebuilding her former glory. The genius of the Carthaginian general, Hannibal Barca did not suffice to overpower the might of the Roman Republic. Ultimately he found his match in the Roman general, Publius Cornelius Scipio who faced him in the last decisive battle of the war at Zama. From that day onwards the Roman general was known as Scipio Africanus. Gameplay: Players start in up to 8 selected territories scattered across the map. The number of players can range from 2-8. The rest of the territories will be neutral and will have to be conquered by each player. The 8 starting territories are Numantia, Derdosa, Ticinus, Illyria, Illyrian Pirates, Arae Philaenorum, Cirta and Numidia. Initial forces: Each player starts with 5 units per territory occupied which varies according to the number of players. Last edited by Ruben Cassar on Wed Jul 02, 2008 3:54 pm, edited 7 times in total. qwert wrote: You mean B.C. A.C. is in Latin. A stands for "ante" or before in English. Oh,ok. aim mix A.C. with A.D. This should make a cool map, i cant wait to see how it ends up! I love the gfx, the mts are awesome! What are the 2-8 selected territories that people might start on? dittoeevee8888 wrote: What are the 2-8 selected territories that people might start on? Yes, you're right. I forgot to mention them. They are Numantia, Derdosa, Ticinus, Illyria, Illyrian Pirates, Arae Philaenorum, Cirta and Numidia. It's hard to put in more territories with the current map size restrictions! the filters you put on it look too textured than smooth, like the grain filter, and the one that puts the textured affect on th edges. hmm...maybe something a little smoother would work, or maybe its just me that thinks this? Aaaargh Tom! What are you telling me? I love that sea! Me2, but id love it more if you made it more green. maybe a tone down would do the trick? But I look out of my window and I sea that blue sea not green. The Mediterranean is blue. I recognise the Mediterranean sea even in a movie. It's different from other seas. It's home. It's...well...it's the sea I learned to swim in! The sea where I caught a small squid (or was it a calamari?) and I just couldn't bear killing it so I released it again...ah happy memories. Hehe I'm in a strange mood today guys. Sorry! Seriously though...don't you think the Mediterranean is of a more blueish colour than a greenish one? I really hate the red on the top and bottom borders...it really stands out, and I dislike it. Proably toning it down? I don't really know. 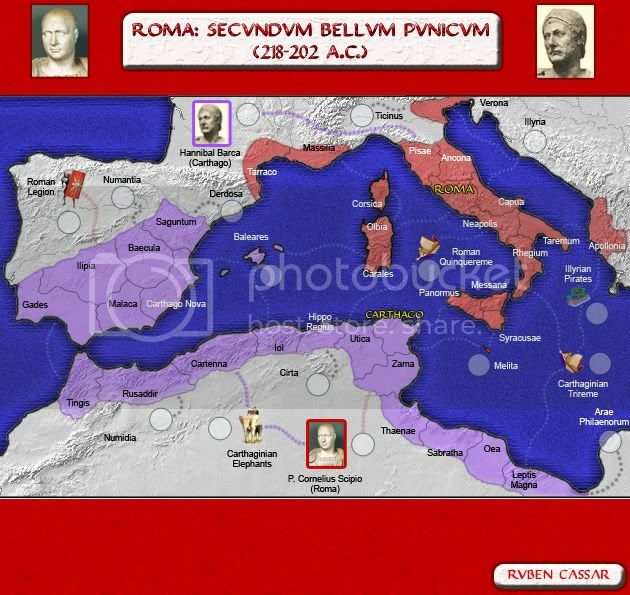 Also, I can't really read the purple territory beside Hippo Regius and Cartenna. I think you should change all the purple background territories should have white text. dittoeevee8888 wrote: I really hate the red on the top and bottom borders...it really stands out, and I dislike it. Proably toning it down? I don't really know. 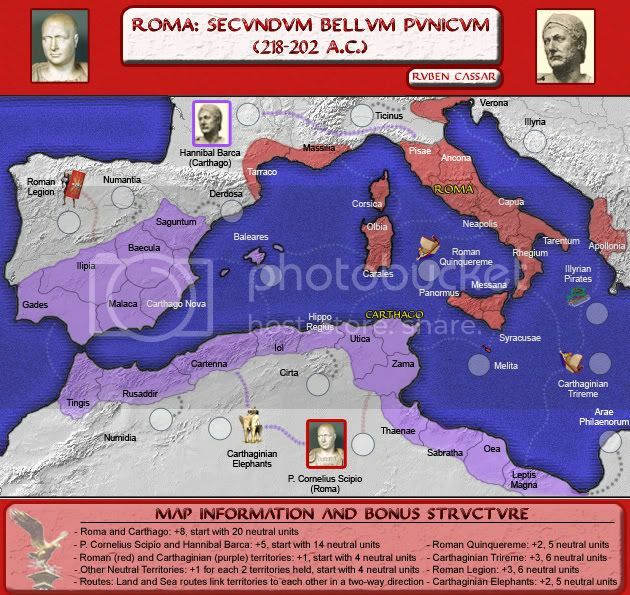 The red is supposed to be Roman territory and the purple Carthaginian. That territory is Iol. It's a strange name. Not lol but Iol. Perhaps I will try to change all purple territories to white. Edit: Ah just understood what you meant about the red parts. You meant the top and bottom segments. Hmm do other people dislike them? I could change the colour of course. Last edited by Ruben Cassar on Mon Jun 23, 2008 4:07 pm, edited 1 time in total. Hmm. I might try some other shades in future revisions and make a poll? Sure thing. I look forward to seeing this map develop. No qwert that would be lame of me. Thanks for the offer though! Ah qwert. You know me so well my friend! :p Melita was a very important strategic territory during the Punic Wars. The Maltese revolted against the Carthaginians to join Rome and Rome made them a civitas foederati as a sign of gratitude, in other words allies not conquered people. The Maltese even sent representatives to the Roman senate! 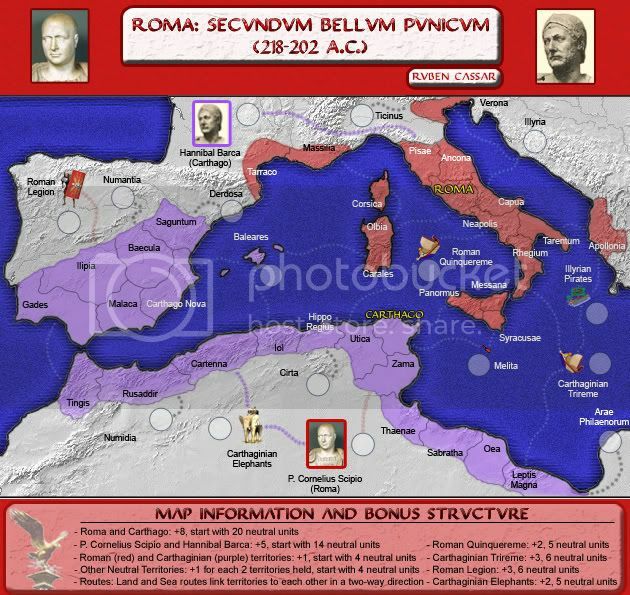 Anyway I have always wanted to make a map about the Punic Wars. It's got nothing to do with Melita. well i spend 5 minutes to create some example(i have free 5 minutes). you can reconsider these.its can be like-Rubben Qwert Ancient roman Map Series. Any way its interesting idea,but you need to give more ancient look of background and nonplayabile terittories.